Zhou Leyuan, the founder of the popular Beijing school of painting, was active between 1879 and 1893. Every artist of the first phase of the school owed a considerable debt to Zhou, and most began their careers by copying his style and signing his name; some even appear to have devoted most of their careers to producing copies of his work. This spectacular example comes from early in Zhou's career when he was first becoming justly famous and creating masterpieces that set new technical and artistic standards. 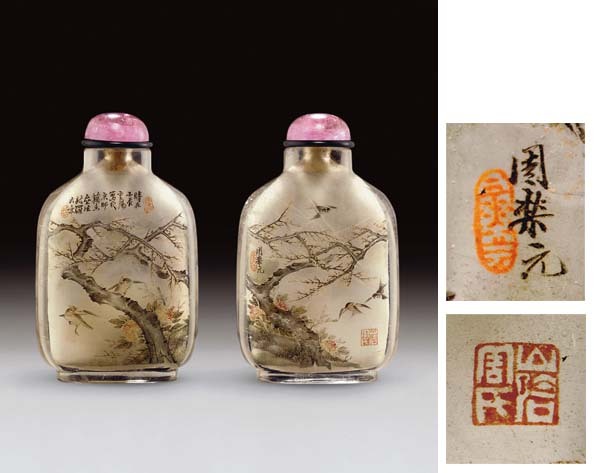 Paired birds on flowering branches also appear in different combinations on bottles painted by Zhou between 1884 and 1892. This is one of the more exceptional versions of the theme where the subtle, subdued colors of the birds' wings and tails are offset by their bright peach-colored breasts and red beaks. The pair of orioles, coupled with the blossoming prunus tree, represent marital bliss, while the peonies symbolize love and affection as well as represent good luck and spring in the cycle of the four seasons. The three swallows, amidst further blossoming prunus and peonies bear further auspicious meaning, as the Chinese word for swallow (yan) is a homonym of the word for "quiet" or "peaceful". This is one of the few bottles which gives Zhou Leyuan's place of origin: Shanyin in Shanxi province. The inscription attributes the painting to Xinluo (Shanren), also known as Hua Yan, the eighteenth- century eccentric painter from Yangzhou, although the style and execution is purely in the classic mature style of Zhou. See the catalogue, Hugh M. Moss Limited, An Exhibition of Chinese Snuff Bottles, June 1970, p. 86, no. 360, for another inside-painted crystal bottle by Zhou. One side is painted with swallows flying amongst the branches of a willow tree while the reverse is painted with a landscape in the style of Wang Hui. This latter example is dated to 1891. For full details of Zhou Leyuan and dozens of examples, see Moss, Graham, Tsang, A Treasury of Chinese Snuff Bottles, Vol. 4, Inside-Painted.